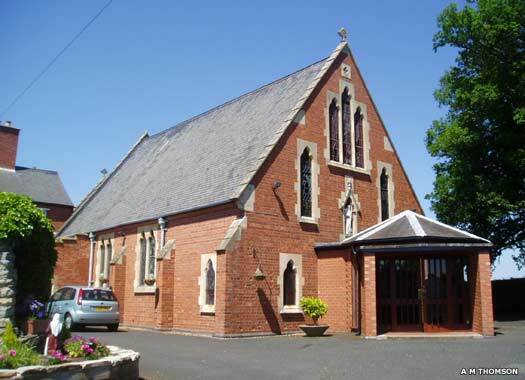 St Mary & St Benedict Catholic Church, Wootton Wawen, is on the western side of the Alcester Road, immediately south of the railway bridge. The church was built in 1904 to replace a chapel next to the Manor house which was maintained by the staunchly Catholic lord and his family following the Reformation. Additional buildings lie behind and to the south of the church. Inside, the former altarpiece is from the old chapel and the glass above the west gallery dates from 1813. 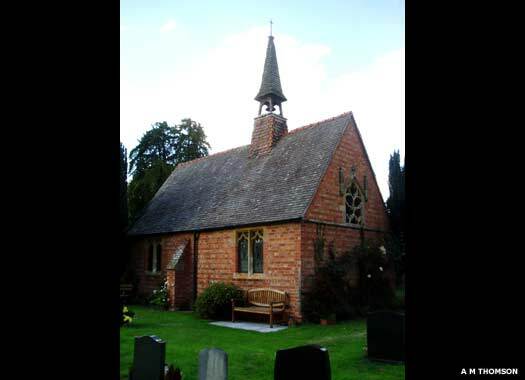 Wootton Wawen Catholic Cemetery Chapel is on the Stratford Road, lying to the east of St Peter's. Barely a quarter of the size of St Peter's churchyard, it contains the small chapel building which was probably put up around the same time as the Catholic church itself, at the start of the twentieth century. As well as the church and cemetery, there is also a Catholic school in the village. An annual All Souls Mass takes place every winter at the chapel, a tradition for all the locals. St Nicholas Beaudesert, Henley-in-Arden, was the parish church of Beaudesert, or 'Beldesert', a derivation from the Norman French for 'beautiful waste'. It lies about 700 metres east of the High Street, on the northern side of Beaudesert Lane at the foot of the hill known as the Mount. 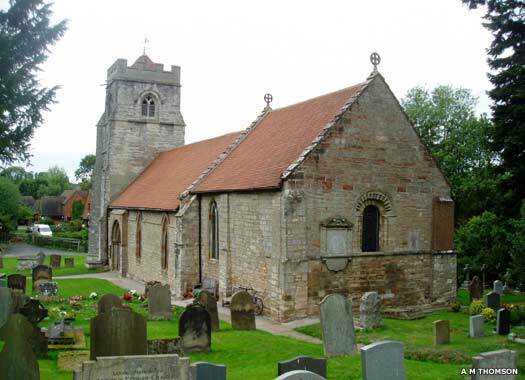 The church's foundation is placed about 1170 and was probably built by Thurstan de Montfort, lord of the Manor who also built the powerful Norman castle on the Mount, no trace of which now remains. 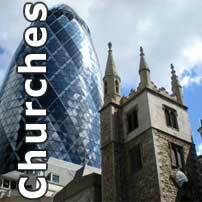 The church probably replaced an earlier Saxon building. At the end of the sixteenth century, it was narrowed by moving the north wall (on the left) about two metres (six feet) further in. 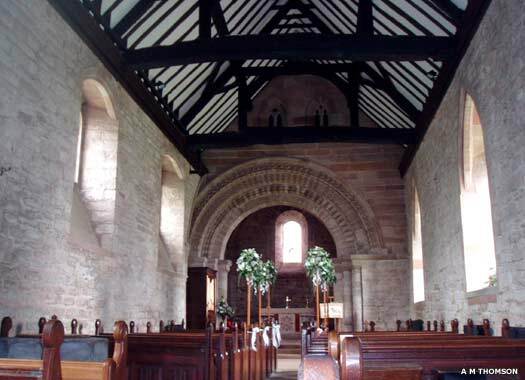 The chancel lost its vaulting, the nave was reduced in height and the present oak timbered roof added. The original Norman roof would have been a high pitched one. 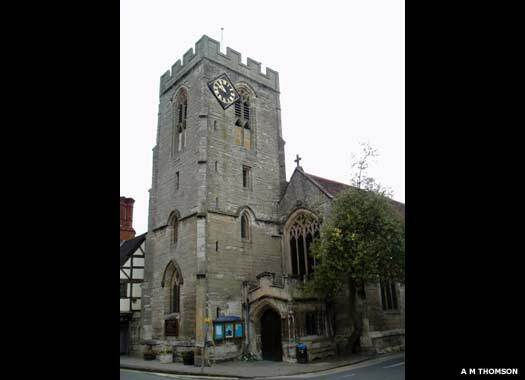 The two benefices of Henley-in-Arden and Beaudesert were combined in 1915 and services are now held regularly in both churches. St John the Baptist, Henley-in-Arden, is on the High Street, on the north-eastern corner with Beaudesert Lane in this small market town. In 1140 Thurstan de Montfort was granted a charter by Empress Matilda, daughter of Henry I, to hold a weekly fair and market in his castle. As a result the people of Beaudesert prospered and the town of Henley started to grow alongside it. The town and castle were destroyed following the Baron's Revolt of 1265, but Henley recovered. In 1367 the townsfolk were allowed to build a chapel at ease so that they could avoid the dangerous journey to Wootton Wawen. This was replaced entirely about 1448 by the present Perpendicular church. 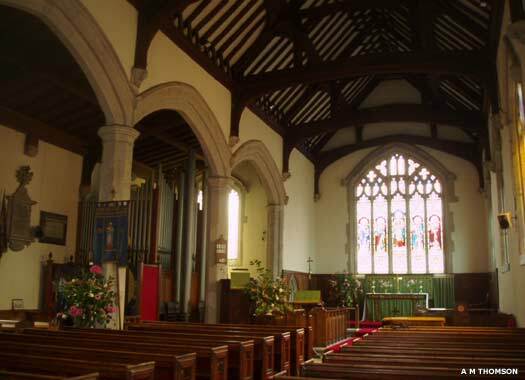 It seems that the influence of Puritanism remained at Henley until as late as the early part of the last century as a communion table stood in the middle of the chancel to enable communicants to partake, sitting round it in accordance with an order made in Parliament in 1644.